Despite unlimited breadsticks, the parent company of Olive Garden, Red Lobster and LongHorn Steakhouse had a rough quarter. Darden Restaurants (DRI) warned Tuesday that earnings in its fiscal second quarter will be significantly lower than analysts had predicted, sending shares down more than 10%. The company blamed transaction costs related to a recent acquisition and the impact of Hurricane Sandy. But Chief Executive Clarence Otis acknowledged in a statement that diners have not responded to the promotions Darden restaurants offered at a time of year when consumers are hungry for a bargain. "These promotions did not resonate with financially stretched consumers as well as newer promotions from competitors," Otis said. "Our disappointing results for the quarter point to the need for bolder changes in the promotional approach at our three large brands." "Crabfest," for example, apparently failed to whet appetites for garlic shrimp and other "succulent entrees" at Red Lobster. And the "SweepSTEAKS" promotion at LongHorn, in which a lucky few could win steak dinners for a year, seems to have fallen flat. Surf and Turf, it seems, is not where American consumers want to save money. Even the offer of two entries at Olive Garden for $25 has not boosted sales. 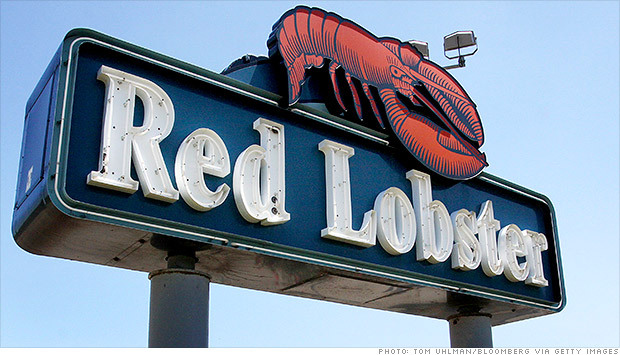 Darden expects U.S. same-store sales in the three months ended Nov. 25 to fall about 2.7% at Red Lobster, Olive Garden and LongHorn Steakhouse. Investors were quick to criticize Darden's strategy, although at least one observer seemed to cut the restaurant chain some slack, according to comments posted on StockTwits. lottafun: $DRI If people cannot afford the promo offers maybe there is something more fundamentally wrong with the company. Even with the poor numbers and weak forecast, one trader remained upbeat. Sejd213: $DRI in my area these restaurants are always busy and seem to be doing well! Darden may be facing yet another challenge.